Not to be a total downer, but the world is increasingly covered in a mess of plastic garbage. And while it's going to take some serious work and patience to address the environmental threat, there's at least one glimmer of hope on the horizon. That's because it appears a crew of scientists just created a special enzyme that rapidly breaks down plastic, and it could have huge implications for the scourge of pollution currently threatening the globe. While researching a special bacterium that appeared to have evolved to "eat" plastic at a garbage dump in Japan, scientists inadvertently created a mutant version of the stuff that is actually better at breaking down plastic bottles. 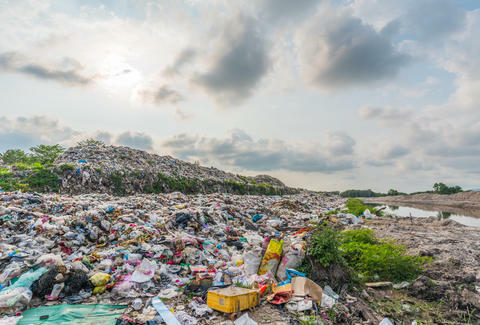 Now that they've gone public with the news of the happy accident in the Proceedings of the National Academy of Sciences, they're hoping it can be used to help address the enormous issue of discarded plastic littering the world -- even in the most remote areas. Without getting too science-y, the enzyme the scientists tweaked had originally evolved to break down something known as polyethylene terephthalate, or PET, which is the plastic that's typically used in drinking bottles. Then, while studying it to see how that evolution in the garbage dump might have happened, they ended up making the enzyme even more powerful and better at breaking it down. In fact, the research suggests this newfangled version of the enzyme can get to work "eating" the plastic in just a few days, compared to the literally hundreds of years it would take nature to do the same thing. Even more promising, the scientists believe they can tweak the enzyme to make it even stronger, and speed up that process further. Of course, it'll take time to implement this mutant enzyme in an effective way if and when it's vetted as a good solution, but there's plenty of work for it to get done. Only 14% of the roughly one million plastic bottles sold each minute around the globe actually gets recycled, per a report in The Guardian, and that means a hell of a lot of it is smothering the environment. Plastic bottles have also played a huge part in creating some alarmingly massive garbage patches in the oceans. It's also worth noting that the scientists behind the discovery believe the enzyme could also used to help recycle plastic to the point where we don't have to create any more, since it literally breaks the stuff down into its raw components. So, hey, that's at least something to potentially look forward to.